This meatless main dish or side for beef and chicken is made completely from scratch and is oh so delicious! Who is totally over cold and flu season?!? And I'm sure many of you reading this post, as well. We are currently stuck at home with a sick little girl who's temp is 101.7 at the last check. I've been oiling her, myself and the rest of the family up with my essential oils in hopes we kick this sickness out of the house ASAP! Since we're stuck in the house, it's a great day to watch Netflix with her on the couch, drink some tea and catch up on some blogging! 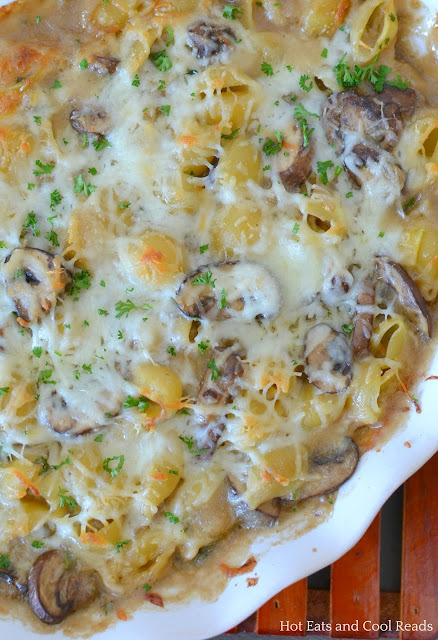 Today's recipe is some cheesy, carb filled goodness and once again, I'm joining my blogging buddies for a meatless casserole round-up! 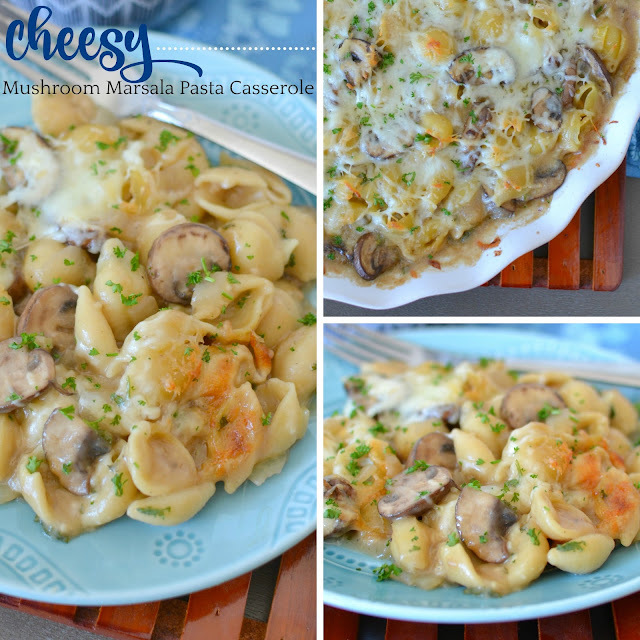 This Cheesy Mushroom Marsala Pasta Casserole is great as a main dish for those of you who are vegetarian, or like going meatless or a side dish to any meat you may be serving for dinner! 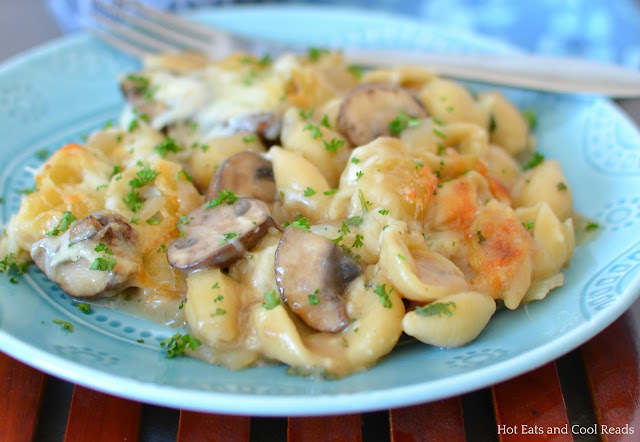 The sauce is completely homemade and the mushroom and marsala combo is amazingly delicious! If you've been following me for awhile, you know how much I love pasta and mushrooms, and know this is going right to the top of my favorite recipe list! Since I have some marsala cooking wine leftover from this recipe, I'll have to give marsala chicken a try next time and post on here sometime in the future! Let's check out my blogging buddies meatless recipes! If you liked this recipe, give these casserole recipes a try: Cheesy Fiesta Chicken and Rice Casserole, Pizza Tater Tot Hotdish, Cheesy Ranch Chicken Hashbrown Casserole, Egg McMuffin Breakfast Casserole, Sweet Butternut Squash Casserole or Minnesota Wild Rice Hotdish! Looking for more meatless recipes? Check out these: Onion and Cheddar Mashed Potato Cakes, Buttery Lemon Garlic Rice, Tortellini and Vegetable Soup, Spicy Garlic and Basil Sesame Noodles, Broccoli and Sweet Pepper Pasta or Cheesy Mexican Vegetable Chowder! Cook pasta according to al dente package directions. Drain, rinse and set aside. In a large skillet, heat the oil over medium high heat. Add the mushrooms, onions, garlic, salt and pepper. Saute for 5-6 minutes. Add marsala, then simmer for another 3 minutes, until liquid is almost evaporated. Add the butter, stir until melted, then add the flour. Stir and cook for one minute. Add the broth and simmer for 2-3 minutes or until thickened and remove from heat. Grease a 2 quart baking dish, add the pasta, 1/4 cup parmesan, 1/2 cup mozzarella, one tablespoon parsley and stir. Pour sauce over the top and stir again. Bake for 15 minutes, remove from oven and sprinkle with remaining 1/4 cup parmesan and 1/4 cup mozzarella. Bake for another 15 minutes. Remove from oven, sprinkle with remaining one tablespoon parsley and serve! All that gooey cheese has my mouth watering! I never thought about cooking with marsala without meat. Great idea! Sounds so comforting, and can imagine the nice flavor the marsala will give. I love marsala. I haven't made it in forever. This is going on the menu because it looks fabulous. 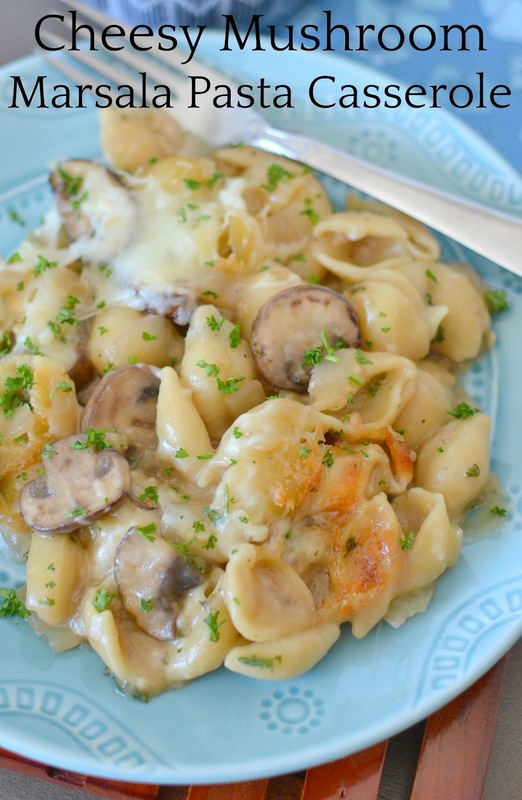 You had me at mushrooms and cheese before you even added the marsala, Sheena. Hope your baby girl is feeling better! this is my kind of casserole! some delicious comfort food! I hope your little girl is feeling better now. She's feeling SO much better! Thanks everyone!